Where unspoiled wilderness and modern, sophisticated cities meet. From the tropical golden sand beaches of the North Island to the plunging, deep waters of Milford Sound at the foot of the South Island, to the bubbling thermal pools of Rotorua, this is a land of wild and vivid contrasts. You’ll feel you are the first to discover these islands of calm, this safe haven of natural wonder. Everyone ventures to Oahu seeking a different experience. Some talk about wanting to find the “real” Hawaii, some are looking for heart-pounding adventure, some yearn for the relaxing and healing powers of the islands, and others are drawn by Hawaii’s aloha spirit, in which kindness and friendliness prevail. You can have all kinds of memorable experiences here. Imagine yourself hovering weightless over a rainbowed sea of tropical fish, sitting in a kayak watching the brilliant colors of dawn etch themselves across the sky, sipping a mai tai while you take in sweeping views of the south shore and the Waianae Mountains, battling a magnificent game fish on a high-tech sportfishing boat, or listening to melodic voices chant the stories of a proud people and a proud culture that was overthrown little more than a century ago. 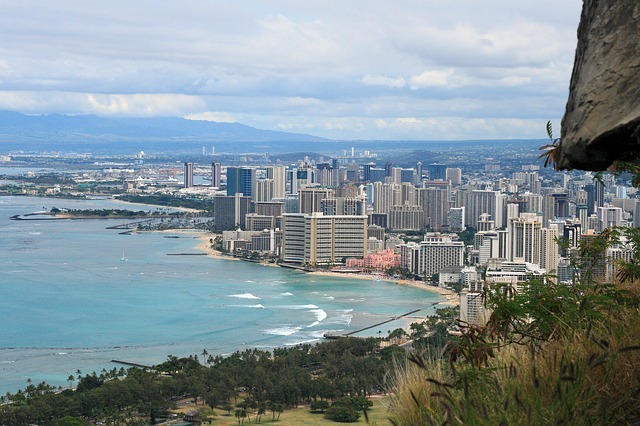 Oahu is separated into 5 main areas: Honolulu, the North Shore, the Windward Coast, Central Oahu and the Leeward Coast. Note that world-famous Waikiki is actually a neighborhood located in greater Honolulu. Oahu occupies 597 square miles and is the second oldest of the six Islands of Aloha, lying between Kauai and Maui. Oahu is made up of two major mountain ranges that were once shield volcanoes that are now extinct. These two mountain ranges – the Waianae range to the west and Koolau range to the east – run almost parallel to each other. Over a hundred ridges extend from the spines of each range creating beautiful valleys and stunning mountain vistas. The Waianae range on the west side, separates Central Oahu from the Leeward Coast and is the oldest part of Oahu at roughly four million years old. For the most part, the leeward (west) side is considerably warmer and drier than the east. The Koolau mountain range spans the length of the island’s eastern coast for about 34 miles from Kahuku in the north to Makapuu in the south. The Koolau range separates the Windward Coast of Oahu from Central Oahu. On the windward (east) side, thousands of years of constant gales have carved beautiful rippling rock faces, near-vertical ridges and precipitous cliffs. You can get a fantastic view of the Koolau cliffs from the Nuuanu Pali Lookout. Today, the Windward Coast tends to be Oahu’s wetter and greener side of the island. There are several smaller post-shield volcanic outcroppings scattered throughout the island, all of which are extinct. These appear in the form of volcanic cones and heads usually no greater than 1,000 feet high and a mile in diameter. The most famous of these include Leahi (Diamond Head) and Punchbowl craters (home to the National Memorial Cemetery of the Pacific), both popular visitor attractions. Koko Head crater sits on the youngest part of Oahu at about 32,000 years old. Oahu is, with the other Hawaiian Islands the home of surfing. Beyond this, it is also the home to some of the worlds best and most famous surf spots. The North shore is packed with familiar names, Pipeline and Backdoor, Off the Wall, Log Cabins, Sunset and Waimea Bay. When the big winter swells come in, the worlds best surfers head here. The south of the island is also a surfers dream with many many class breaks. Unfortunately, due to its image and consequent popularity, Oahu is one of the most crowded and ‘localised’ places to surf. Show a bad attitude, and you may not even want to get back into the water. Honolulu International Airport (HNL) on Oahu is Hawaii’s major airport, serving as the entry point for most of Hawaii’s visitors. All major domestic carriers and many international carriers serve Oahu, so you can get here from just about anywhere. Finding accommodations is easy on Oahu. You’ll find everything here from hotels, luxury resorts, boutiques, rentals and bed and breakfasts. Waikiki is where you’ll find the majority of Oahu’s hotels and resorts. Beyond Waikiki, you can find one luxury resort in east Honolulu (The Kahala Hotel & Resort), one on the North Shore (Turtle Bay Resort) and one on the Leeward Coast in the Ko Olina Resort area (J.W. Marriott Ihilani Resort and Spa), as well as rental cottages and condos throughout the island. Anytime of year is a good time to visit Oahu. The average temperature here is between 75˚-85˚ F. Summer, between April and November, is warmer and drier while winter, between December and March, is a bit cooler. Trade winds keep things comfortable year-round. It is generally drier on the western (leeward) side and wetter on the eastern (windward) side. You can get around by car rental, shuttle, taxi or Oahu’s public transportation system. Many visitors also enjoy taking bus tours to conveniently explore the Island. Others rent mopeds and motorcycles. But to really experience all that Oahu offers, you should consider reserving a rental car in advance from the Honolulu International Airport. Oahu’s city transportation system is aptly named “TheBus.” Fares are reasonable, routes are extensive and there are special visitor passes for multiple day uses. For more information on fares, bus routes to popular attractions and other useful information visit http://www.thebus.org. Another affordable option is the trolley. The routes and destinations are not as extensive as TheBus but the trolley goes to most major tourist attractions and offer tickets for unlimited rides over a certain number of days. Taxis are a great way to travel when in a group and the cost can be shared. You can find taxi stands at most major shopping malls, in the business district and at the airport. Note that rather than hailing a cab, finding taxi stands at major shopping malls and businesses as well as calling for pick-ups via hotel concierge or phone is the norm in Hawaii. Oahu is generally drier on the Leeward Coast (west) and wetter and greener on the Windward Coast (east). The resort area of Waikiki and the surfing mecca of the North Shore offer pleasant weather year round. Big wave surf season on the North Shore begins in November and ends in February. World-class surfing competitions also happen here between November and December. 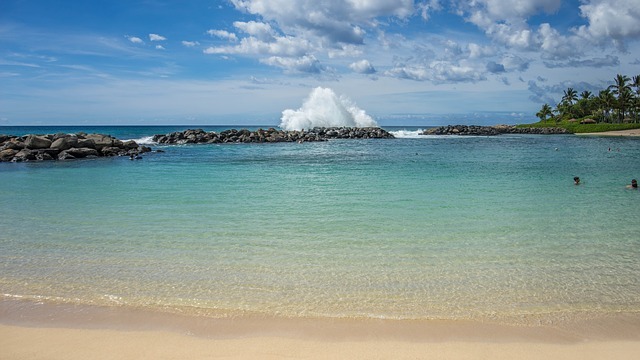 During the summer, the big waves of the North Shore subside for ideal beach going conditions. There are generally two seasons on Oahu. Winter (November through April), when temperatures typically range in the low-70s to mid-80s, and summer when the high can run into the low-90s. Average air temperature ranges from 74 degrees F (23 degrees C) to 88 degrees F (31 degrees C) with moderate humidity of 53% during the day. Gentle trade winds keep even the warmest months comfortable, so any time of year is a good time to visit Oahu.